How Well Do You Know the Ocean? Welcome to the Ocean Literacy course! This course will help you understand how you are connected to the ocean and how the ocean helps you. There are 7 principles in total. Your teacher will help guide you through each of the sections. You can earn Badges by completing each one of these topics. You can also earn badges by completing the assignments in each sections. After you have earned all 7 badges you can take the Final Quiz to earn your Ocean Champion Badge! Click on the badge you would like to earn to get started! Welcome to the Elementary Level Ocean Literacy Course on the Ocean Wise Online Learning Environment. On this platform we have created an international course based on the seven Ocean Literacy Principles designed to help develop an understanding of how humans impact the ocean and how the ocean influences us. This course is geared towards grades 3 to 6, or ages 7 to 11. You may use this resources as you wish, choose to do the full course or just a few of the sections. There is a How to Manual for navigating this site, as well as an introductory video. Under the heading Classroom Tools you will find additional support resources at your disposal, such as lesson plans, activities and worksheet under Teacher Resources. As a teacher, community leader, or home educator, you may join the platform first. This will allow you to view your students’ work and create accounts for the elementary level students. Visit this link, and register using the code Teacher. Once you have registered, visit the Participants section and click “Add Students” button. Here you can create as many accounts as you like for your students. We suggest not using their last names to protect their privacy. You may wish to include your school initials as part of their usernames, as many common names may already be taken. If you click the Register button in the top right hand corner of the screen and create an account, this will automatically register you at the student level. If you are a teacher or educator and need to be promoted to the proper access level, please contact us with your username. Join the Weddell Sea Expedition! 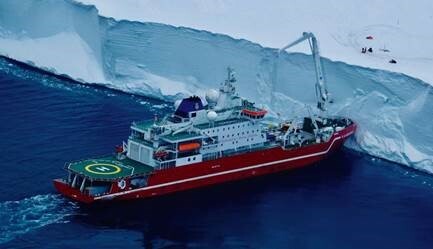 Join the Weddell Sea Expedition! This pioneering Antarctic expedition has been underway since the beginning of January and sending us updates all the way from the Weddell Sea in Antarctica. Visit the Weddell Sea Expedition’s Journey Page to explore what we have learned so far and see video conferences with members of the expedition team and crew. If this sparks your interest, find out more at explore.reachtheworld.org and email lizzie@reachtheworld.org to sign up to virtually join over 200 classrooms across the world who are participating in this exciting expedition!